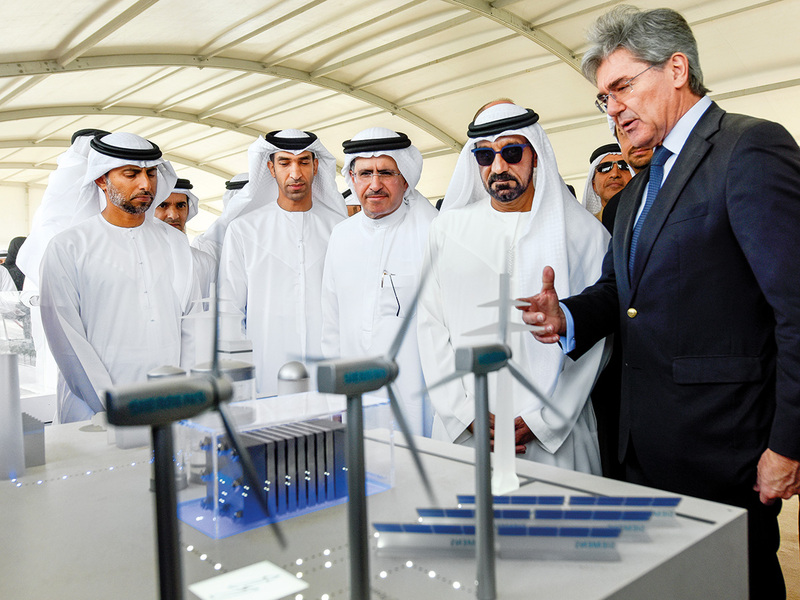 Shaikh Ahmad Bin Saeed Al Maktoum, Saeed Mohammad Al Tayer, Joe Kaeser and Najeeb Mohammad Al Ali during the groundbreaking ceremony of the hydrogen plant. 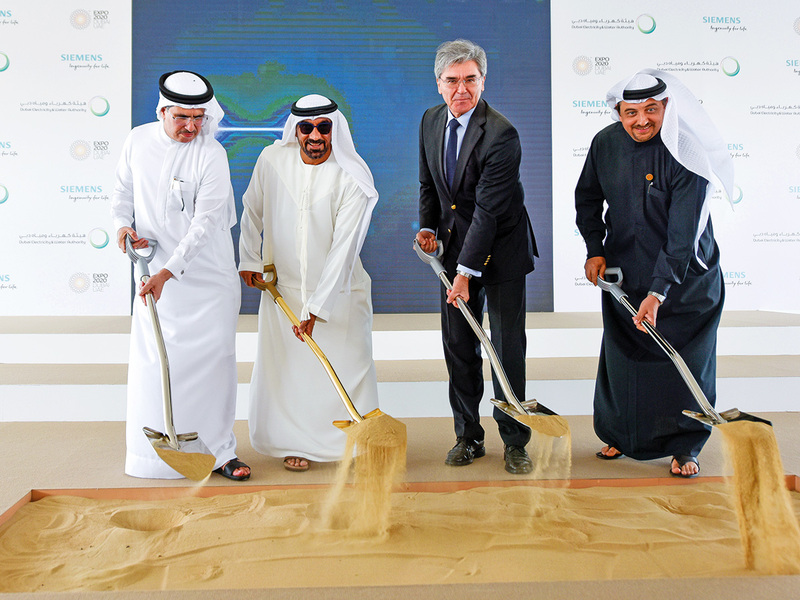 Image Credit: Shaikh Ahmad Bin Saeed Al Maktoum, Saeed Mohammad Al Tayer, Joe Kaeser and Najeeb Mohammad Al Ali during the groundbreaking ceremony of the hydrogen plant yesterday. Dubai: Dubai has begun implementing its plans to explore the potential of producing and using hydrogen as a low-carbon energy source that could boost security of energy supply in the future. Senior officials on Sunday broke ground on the Green Hydrogen Project in Seih Al Dahl. Located at the Mohammad Bin Rashid Solar Park, the plant will be powered using energy produced at the park. It is a private-public partnership between Dubai Electricity and Water Authority (Dewa), Expo 2020 Dubai, and Siemens. The Dh50 million plant, considered a first-of-its-kind project in the Mena region, will produce hydrogen as alternative fuel specifically for mobility such as public buses at the Expo 2020 Dubai. Shaikh Ahmad Bin Saeed Al Maktoum, Chairman of the Dubai Supreme Council of Energy, was present at the groundbreaking ceremony. Shaikh Zayed Bin Sultan Bin Khalifa Al Nahyan, Chairman of the Board of Trustees of Shaikh Sultan Bin Khalifa Al Nahyan Humanitarian and Scientific Foundation; Saeed Mohammad Al Tayer, Managing Director and CEO of Dewa, Suhail Faraj Al Mazroui, Minister of Energy and Industry, Dr Thani Bin Ahmad Al Zeyoudi, Minister of Climate Change and the Environment and Joe Kaeser, President and CEO of Siemens, were also present along with other senior officials. “Our aim is to make Dubai a model of energy efficiency and safety,” Shaikh Ahmad added. Covering an area of 10,000 square meters, the Green Hydrogen Facility will produce hydrogen that can have three uses, Al Tayer said. “The hydrogen produced at the facility will be stored and deployed for re-electrification, transportation and other industry uses. It can go to the grid, used internally, or can be used to store at night. This project will be an important contribution to the evolving energy mix in Dubai and the UAE,” Al Tayer said. “This could mean security of supply of energy but that’s in the future,” Al Tayer said. Dewa and Siemens plan to have the pilot project operational for the Expo 2020. They will conduct a test and trial phase before next year to ensure maximum standards of safety and reliability. Al Tayer said the results of pilot study will determine the scalability of the project. “We have to study and assess the results. Maybe in the future, it will add to the diversification of the energy fuel mix in Dubai. So definitely, the future will be promising,” Al Tayer said. Based on the Dubai Clean Energy Strategy 2050, Dubai aims to generate seven per cent of Dubai’s total power output from clean energy by 2020, 25 per cent by 2030 and 75 per cent by 2050. The Green Hydrogen Plant will use electrolysis, a process of using electricity to produce hydrogen from water. Electrolysers are used to split water into hydrogen and oxygen. The plant will utilise 1.25MW energy from the MBR Solar Park and then utilise 350-litres of potable water per hour to generate hydrogen. The plant has one 280-KW turbine as well that can generate power from wind that can be used onsite.